Alexa private skills are voice-powered capabilities that enhance the Alexa experience while remaining private to members of an Alexa for Business organization. With Alexa for Business Blueprints, you don't need to write a single line of code to create a private skill for your workplace. Select one of dozens of easy-to-use Skill Blueprints, add information such as common questions and answers for your workplace, and publish the skill to Alexa for Business as a private skill. Go to the Alexa Skill Blueprints website and log in with any Amazon account. After you login, your account will be enabled to publish private skills to your Alexa for Business organization. Select a Skill Blueprint that looks useful for your organization and fill in the blanks to “Make Your Own” skill. We recommend the Business section to get started. If you're looking for additional ideas, check out the Alexa for Business Blueprints Ideas on this page. After testing your skill, choose Publish. Choose Alexa for Business (do not select Skill Store) in the popup window, and fill out the details. After your skill is live (about 20 minutes), choose Manage Access and enter the value for the ARN that you'll get from your Alexa for Business administrator - it'll look something like this: arn:aws:iam::123456789012:root (the number will be different). After your skill is submitted, let your IT admin know the name of your Blueprint skill and what rooms you want it enabled in, or if you want the skill available to all of the company's enrolled users. Business Q&A blueprints can be used to create Alexa skills to help with common questions around the office. “When is open enrollment?” “What are the hours for IT?” “Who's in charge of social media?” and any other questions you can think of, can be answered using a skill generated from the Business Q&A blueprint. Consider using the Business Q&A and Flash Briefing blueprints as an innovative and engaging part of your corporate communications. For new employees on a team, it can be challenging to get up to speed. Consider using the Onboard Guide blueprint to answer location and how-to questions, as well as to provide a key set of contact information. With a Flash Briefing skill, it's now easier than ever to share the latest news and keep others in your organization up to date. You can add a recorded audio feed URL to the Skill Blueprint directly, upload recorded audio files, and even record live audio directly within the Alexa Skill Blueprints Portal. After you publish your Flash Briefing blueprint skill as an Alexa for Business private skill and it's enabled by your IT admin, end users can simply ask “Alexa, what's new?” to hear your content. How Many Days can be used to help users stay up to date on how many days remain until key events such as product launches, open enrollment, and other important dates. Organizations wanting to share audio feeds privately with Alexa, can use the new University Blueprint to make their live and recorded audio content accessible on Alexa-enabled devices. You just add your audio feed URL to the Blueprint, and customize the welcome and exit messages for your skill. By publishing the skill as an Alexa for Business private skill, you can ensure that only members of your organization can access that content. There is no limit to the number of skills you can create. Visit the Blueprints site today to start building your Alexa for Business private skill today. Getting started is as simple as filling in the blanks. We're always looking to improve our features so please feel free to send us feedback. We can’t wait to see what you create! Developers have even more ways to deliver engaging voice experiences for Alexa for Business organizations. If you want to integrate Alexa with your business applications and/or workflow, you can build a custom Alexa for Business private skill. Alexa private skills are voice-powered capabilities that enhance the Alexa experience while remaining private to members of an Alexa for Business organization. 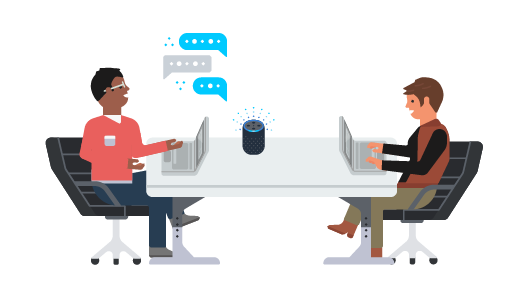 Using the Alexa Skills Kit, developers of any level can build custom Alexa skills. With Alexa for Business, you can make these skills available to devices and users, managed in your Alexa for Business account, without having to publish them in the public Alexa Skills Store. To learn more about building skills, please see the Alexa for Business Administration Guide. Alexa for Business offers additional APIs included in the AWS SDK/CLI which you can use to add context to skills, and automate integration or administrative tasks. For example, the ResolveRoom API provides device location to improve the voice interaction for users. Developers can use Alexa for Business APIs and SMAPI to auto-generate enrolled user invitations and Alexa for Business private skills that act as a voice front-end to interact with the platform. To learn more about Alexa for Business APIs, please see the API Reference Guide. Get started building with Alexa for Business Blueprints now.